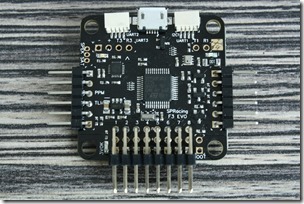 The SPRacing F3 EVO is another flight controller, designed by Dominic Clifton. He stands behind the Cleanflight firmware and FCs like SPRacing F3 and SPRacing F3 Mini. I will start with some key features and show you how to setup the SPRacing F3 EVO. 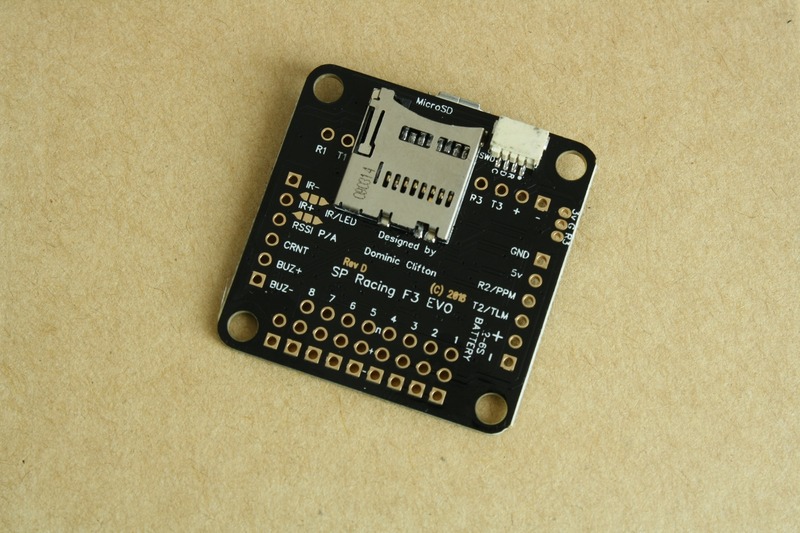 The SPRacing F3 EVO has a 72MHz F3 MCU, which in combination with the MPU9250 acc/gyro/compass connected via SPI, should allow you to achieve a very low looptime. On a FPV race quad you don’t need a barometer, but it is maybe built-in for the folks going to use the flight controller with a GPS. You have 3 serial ports for connecting additional hardware, like GPS, OSD or Bluetooth. The MicroSD-Card socket allows MicroSD and MicroSDHC cards for now, due to the Cleanflight firmware. 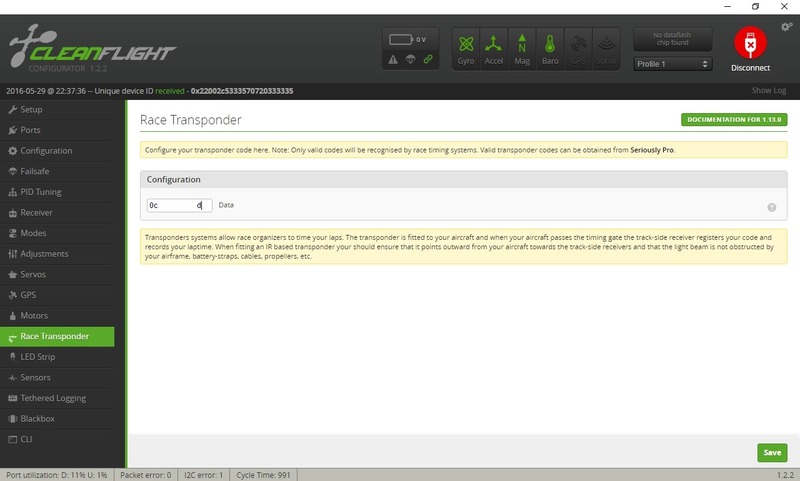 You can enable the Blackbox feature in Cleanflight in order to save your flight logs and analyze these. The SPracing F3 EVO supports PPM, SBus, SumH, SumD, Spektrum and XBus receivers without the need of an external inverters. The main disadvantage in my opinion it the missing built-in voltage regulator, so you can not directly power the FC from the LiPo battery. In order to setup the flight controller you need to solder the pin headers first. I personally prefer the right-angled pin headers, because on my SG Acro FPV frame, I need the space above the FC for the FPV pod. 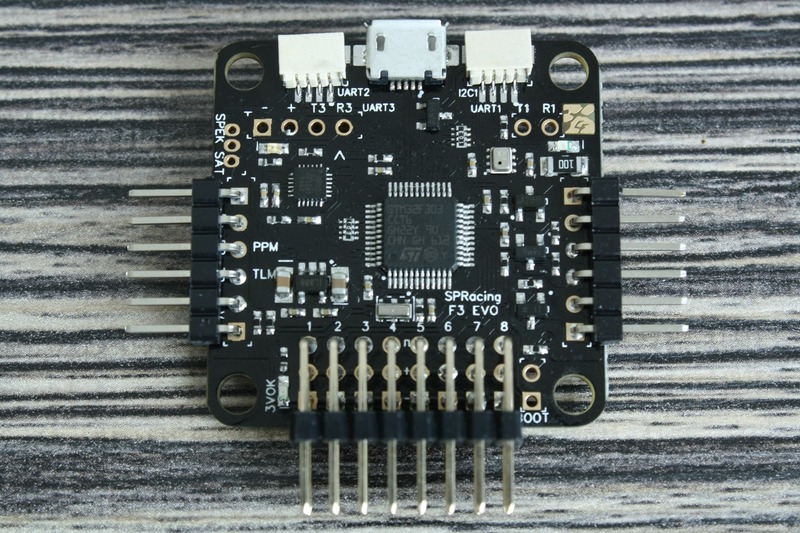 After soldering the pin headers you need to decide, if you are going to use the board with the IR Led transponder or with programmable RGB LED. You need to create a solder bridge between two pads on the back side of the FC. I decided for the race transponder, so I bridged the left arrow and the square. If you want to use the FC with RGB LED bridge the right arrow and the square. Note: do not bridge all three pads. 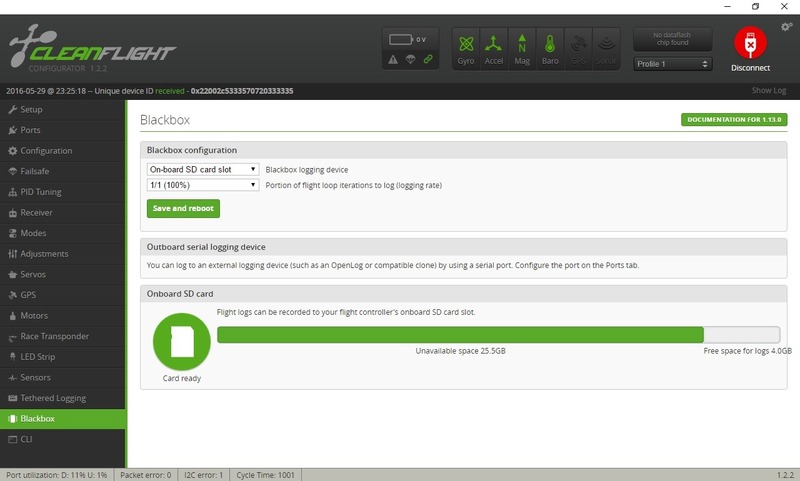 I wasn’t able to install the newest Cleanflight firmware (1.13 RC1) on my SPRacing F3 EVO using the Cleanflight Configurator. I have already installed the DFU drivers on my Windows 10 laptop, but Cleanflight Configurator does not show that port. I started the DfuSe Demo and updated the firmware, the same way I updated the firmware of my KISS FC. 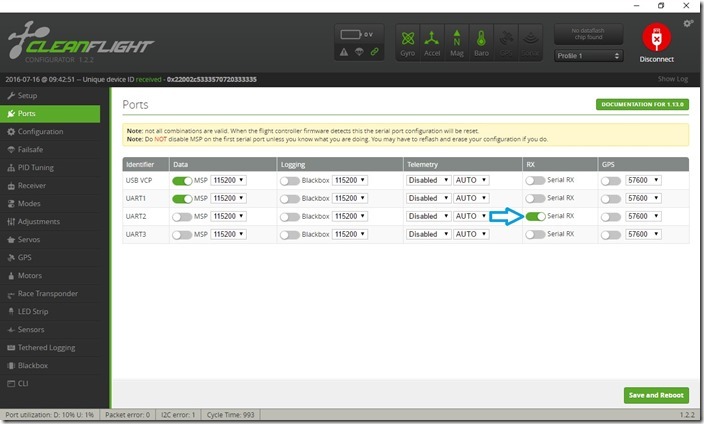 The only difference is, that you need to convert the Cleanflight hex file to dfu file using the “Dfu file manager”. Note: to update the firmware, you need to put the FC in boot mode by bridging the “boot pads/holes”. I really like the boot though-holes, because it so much easier to bridge these with the supplies pin header and a jumper. 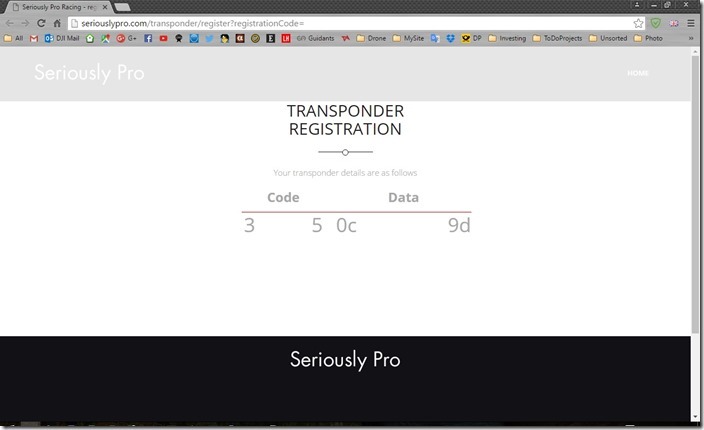 There was a sticker with code on the FC package, which is your unique “Transponder Code”. I still can’t find a working link to the SeriouslyPro website, where you can convert the code to the needed hexadecimal code. But you can scan the QR code with your smartphone and the website with your code will open. I haven’t installed any apps, just used the Ebay app and its integrated QR scanner. Enter the code in the Cleanflight Configurator as shown and click on “Save”. 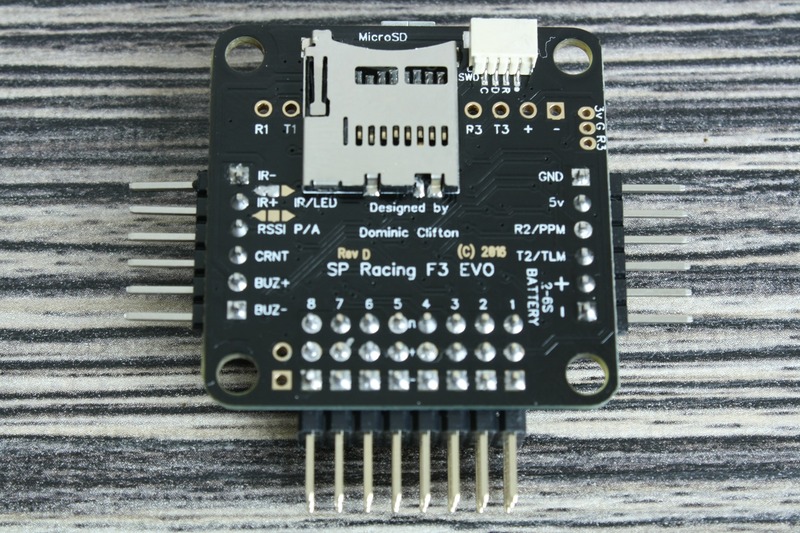 You need 5V power supply to power the SPRacing F3 Evo. 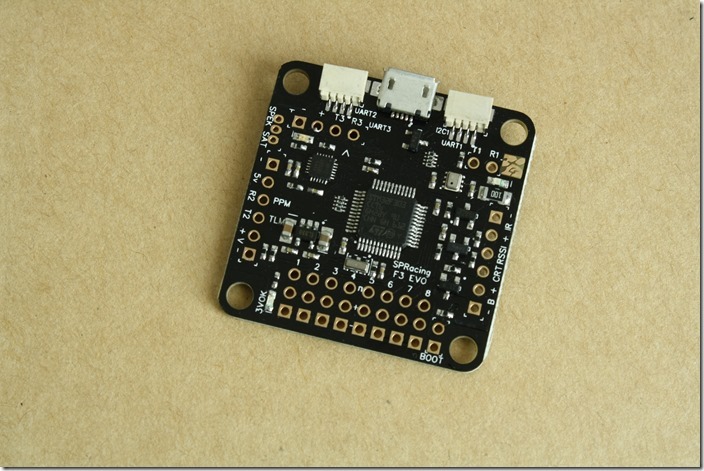 You can use a power distribution board with integrated 5V BEC or ESCs BEC. Dominic has created extremely good manual for the FC, so check on page 4 how to connect your receiver, OSD or GPS. I am using the FrSky X4RSB receiver in SBUS mode. 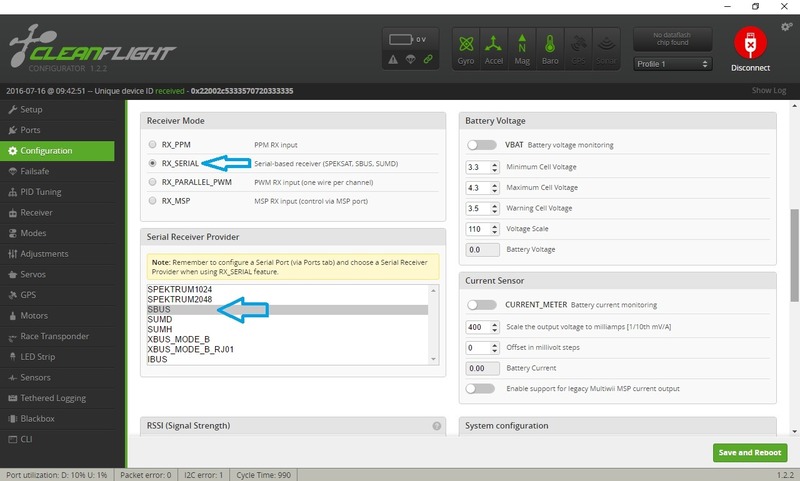 To get it working with the SPRacing F3 EVO go to “Ports” in Cleanflight configurator and select “Serial RX” on UART3, like in the picture below. 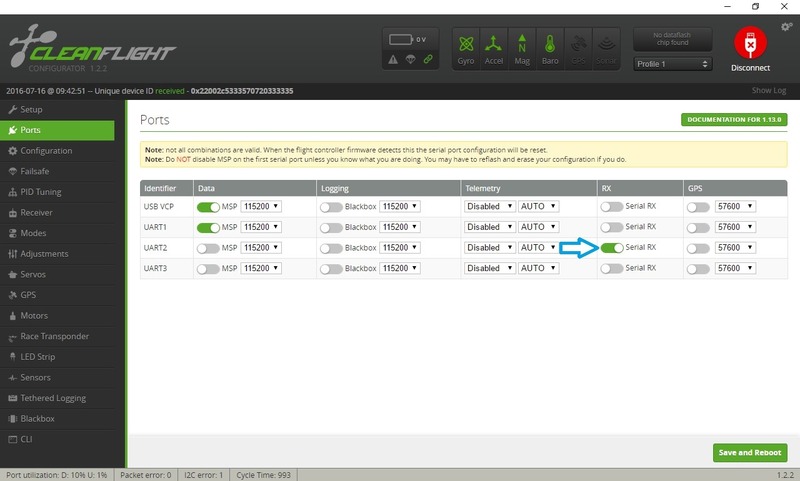 Then switch to the “Configuration” tab and choose the “RX_SERIAL” and “SBUS”. Save and reboot and now you should be able to see the bars fluctuating in the “Receiver” tab. 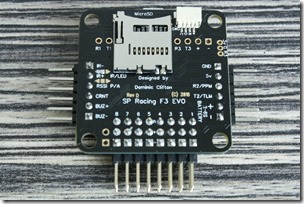 One of the key features of the SPRacing F3 EVO is the MicroSD-Card socket. You can store up to 4GB of flight data on a MicroSD-Card, which will be perfectly enough. Transferring the log from a data flashchip (like CC3D or Naze32 rev6) was a pain due to slow transfer rate. Now you can take the MicroSD-Card out and read it on your PC. You can check how to configure the Blackbox feature here. 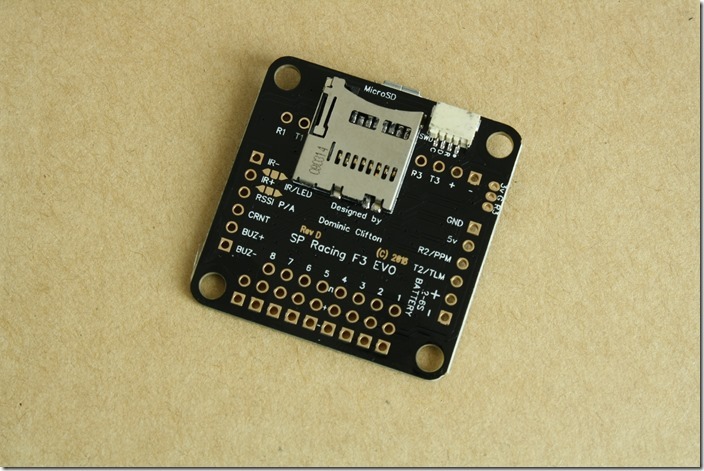 Just like the Naze32 rev6 the SPRacing F3 EVO support flashing and configuration of BLHeli ESCs through the ESC signal wire. Note: you need the latest BLHeli Suite version (16.0.14.5) or it won’t work! So far I like the board, but need to play a bit with the looptime and check how it will perform in the air. You can get the SPRacing F3 EVO from the Seriously Pro webshop for £27.50. I have had no luck with this board, This board has caused me to many issues. The quadcopter does it’s own thing. I can’t trust this board, it just went insane when it wasn’t even armed and cut my hand.. fun. I’v had no luck with tuning and i’m only getting more anymore frustrated, and to top it all off nobody seems to know much about the board. 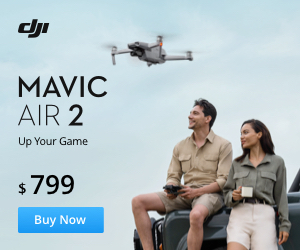 I really need someone to reach out and help me go through my quadcopter. Im knowledgable, i just don’t understand how all these problems could occur.